The Magical Awakening may have brought magic and magical creatures out of their prospective closets several years ago, adding to human perception and widening the world dramatically, but it didn't solve any problems. Created a few, but didn't solve any. In the city of Nekros, a southern city in one of the territory folds that people hadn't realized was there Before, it provided wyrd witch Alex Craft a profession as a PI, but her grave magic and the ability - necessity, really - to raise shades hasn't exactly filled her coffers to overflowing. Estranged from her wealthy political family because of her abilities and caught up in two powerful and high profile cases, Alex would be lucky just to survive, let alone get a paycheck that would stave off the bill collectors and keep her Chinese crested dog PC in kibble. Her friend...er...well...sorta...Death, a soul collector she first met as a child, breaks all the rules when he shoves her out of the path of an assassin's bullet, but the collateral damage, and the bullying tactics of the gorgeous but suspicious detective Falin Andrews, assures Alex's dogged determination to stop a force of evil the likes of which Alex has never heard of before...before she succumbs to the foul, dark magic attacking her soul. 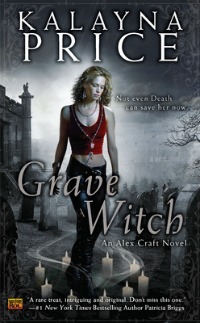 While Grave Witch may not break huge ground in the UF genre for originality or uniqueness, Kalayna Price delivers on a solid, well developed novel with a likable protagonist and enough conflict to hold a reader's attention and garner some fans. And there are some nifty little twists and some characters that provide a true thrill here and there. Perhaps underused, I enjoyed the concept and the character of Death and wish he'd been given more page time. Falin and several other secondary and ancillary characters also added to the charm. What I appreciate most, especially after the last debacle I read, is that Alex is a solid heroine, with her own flaws and peccadilloes - that make her human instead of annoying, aggravating, and frustrating, and I credit Price for fleshing out her character slowly and with subtlety instead of hitting us over the head with an abundance of exposition. 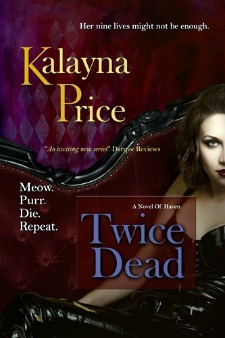 That's actually a strong suit of Price's that I noticed from the first two books of her Haven series, Once Bitten and Twice Dead. She drops you into the lead character's head and instantly takes off with the story, and while it can be slightly confusing at first, it allows for the world around the heroine to develop and come into focus in a very organic and pleasing fashion that ends up feeling more true to the situation than suffering through a ton of first person POV narration or a more clinical third person POV world building. I don't have a full and clear view of the world of Alex Craft just yet, but enough has been naturally fleshed out to keep me satisfied until the next book. The plot is good, though it lacks some originality and clear definition that would push it to the next level. Unknown Big Bad is viciously killing for nefarious black magic purposes, leading up to a heinous black magic ritual and the heroine has to stop it before the world as everyone knows it comes to an ugly end. That's the skeleton of the situation, and frankly, it's been done before. On the plus side, Price does it with an appealing heroine and two...um...men?...males?...guys - lets go with guys - who both provide some eye candy and carry around some delicious secrets of their own. Price also adds one or two neat twists in the plot that I hadn't seen coming and added depth and complexity and bodes well for the continuing series. On the slightly negative side, Alex's magic methodology flashed me back to very early Anita Blake in a couple of places. Enough so that one or two scenes seemed eerily and uncomfortably familiar. I'm no longer a fan of the Anita Blake series and stopped reading it several books ago (around the time they started to make me throw up in my mouth a little), so any similarity to it tends to really turn me off. In the long run, I fully expect to see more individuality and depth from Alex in subsequent books and am not really expecting any appearance of similarity to continue as she and the world around her further develops. 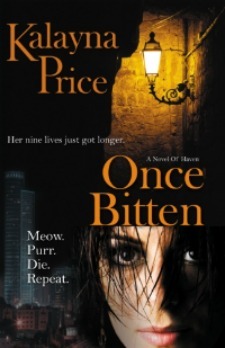 I'm so glad I came across Kalayna Price when Once Bitten was offered as a free Kindle download, even though I wasn't totally thrilled with that book, nor comfortable, just yet, with Price's writing style. 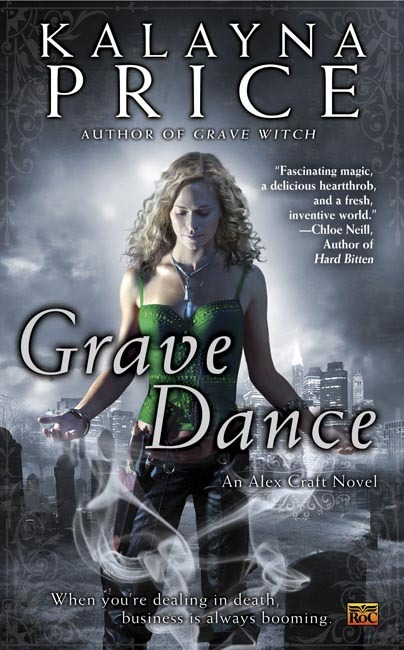 Twice Dead impressed me, though, and I'm very pleased with what I've read in Grave Witch. The overall effect of this book may not glitter like diamonds, but it's significantly brighter than some of the stuff I've been reading lately, and it's more than enough to hook me into the series.